A cartridge headstamp is a mark, or series of marks impressed, or sometimes embossed, on the head of the cartridge case during its manufacture. 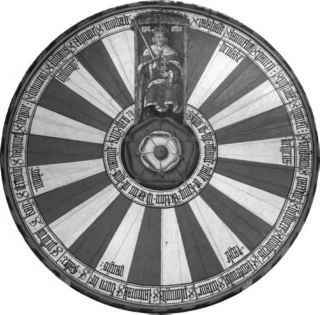 The mark can consist of numbers, letters, trademarks, figures or any combination of these. Systems of headstamp markings are used worldwide. They can be in any language, numbering system or can relate to any calendar. From these impressions, one can, depending on the type of ammunition and its origin, determine the manufacturer, calibre, type, date of manufacture, batch number, case material, and so on. This information only relates, however, to the cartridge case and does not necessarily indicate that the other components, that is, primer, bullet and propel-lant, were of the same origin as the case. Many cartridge case manufacturers sell their cases to small companies who load them to their own specifications, and it is not unusual to find that the bullet, cartridge case, propellant and primer all have different sources. Occasionally, the base of the bullet may be marked to indicate its origin, and in some cases, the primer itself can be marked to show its origin as well. This will aid the identification of the separate components, but it is not nowadays a common practice. The headstamp is also sometimes used as a medium for advertising, and a gun manufacturer, such as Holland and Holland, can have ammunition supplied with its own brand name impressed on the base. In such cases, it can be extremely difficult to find the original manufacturer of the cartridge case. In general, however, the headstamp found on commercial ammunition will only show the manufacturer and calibre. Occasionally, other information such as bullet type, case material and priming compound, that is, ' Staynless' is also impressed on the base. It is rare for commercial ammunition to include the date of manufacture and/or batch number. In many cases, it is possible to assign an approximate date of manufacture to commercial ammunition and sometimes its exact factory of manufacture by the design of the headstamp. 1. Remington 0.22" long rifle ammunition, the company logo, a " U', gives an indication of the date and country of manufacture as follows (Figure 2.17). 2. Browning ammunition was made by Amron up until January 1973, and had the word " Browning' stamped at the 12 o " clock position. From November 1972, when the ammunition company Winchester Western started to manufacture the ammunition, 'Browning' was stamped at the 6 o'clock position. 3. From 1867 until 1911, the American company Union Metallic Cartridge Company used " UMC' on its ammunition. After 1911, it was changed to 'Rem UMC'. Military ammunition, on the other hand, will, with very few exceptions, always include the year of manufacture as well as the month or batch number. Other information can include case material, propellant type, bullet type, that is, tracer, armour-piercing, and so on (Figure 2.18). Figure 2.17 Codes used by Remington. Figure 2.18 Examples of British military headstamps. Headstamps on military ammunition are usually applied in a strict pattern, rarely deviating from the official pattern. Thus, from the position of the various numbers and characters around the rim, it is often possible to source the ammunition without actually deciphering the headstamp itself. One anomaly with respect to military headstamps is Japan. Up until 1945, all Japanese Army ammunition was bereft of markings. Only the Japanese Navy used headstamps on its ammunition. These headstamps consisted of a mixture of a Japanese ideogram and Western numerals. When deciphering these head-stamps, it should be remembered that the Japanese calendar was used for the year markings; thus, the Japanese year 2600 relates to the Western year 1940. Taiwan also has its own calendar system based on 1912, the year which sig nalled the end of dynastic China and the formation of the Republic of China. Mexico also uses 1912 as the starting date for its headstamps, this being the year of its revolution. One problematical area in the sourcing of ammunition arises with ammunition produced for clandestine purposes. In cases of insurgency or irregular warfare, friendly nations will often attempt to hide their part in the supply of arms and ammunition. Obviously, cartridge cases picked up after an incident are a potentially valuable source of information as to the other side's supporters (Figure 2.19). Figure 2.19 Examples of headstamp markings on clandestine ammunition. Broadly, three methods have been used in attempts to disguise the origins of the ammunition. The most obvious is by the complete omission of the headstamp. This can, however, lead to problems in identifying the date of manufacture should a problem arise with the ammunition. It can also prove problematical for the end user in sequentially using the ammunition. The next method is to omit all but the date, or a code identifying the date. Finally, the use of a completely false manufacturer's code can be used. It is possible, however, to penetrate the disguise by identification of the components, primer and neck lacquer or even by the style of the letters used. 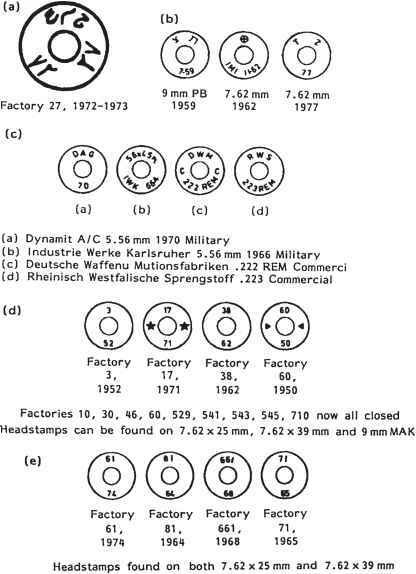 Figure 2.20 Examples of headstamps: (a) Egypt; (b) Israel; (c) Germany; (d) USSR; (e) China. markings, more recently, it has been turning up with either the manufacturer's mark omitted or with no markings at all. Some general examples of headstamps from different countries follow (Figure 2.20). What are the headstamps codes for 25x137 mm shell? What are the US arsenal cartridges identifying letters? How to photograhp Ammo Headstamps? How to identify headstamps on bullet cases? How to identify federal 223 ammo headstamp without date? How to Identify Ammunition Headstamps? How to identify military brass headstamps? Which ammo manufacturer headstamp U, .22 lr, lead bullet, brass case,? How to identify the marketer of a cartridge from headstamp information? How to id head stamp of ammo case? How to Identify Military Ammunition? What are vcartridge head markings for? When was "U" wased as a cartridge headstamp? How to identify shell case head stamps? What headstamp code is used for Remington arms pistol cartridges? What .22 Long Rifle Shell has a Triangle stamped on the head? How to read the head stamp on military ammo? How to identify a bullet casing by its headstamp? How to identify ammo from stamp marks? How to tell the manufature of a 7.9 bullet? What are the different markings on ammo cartridges? What the ammo shell case head? What can a headstamp tell a forensic firearms examiner? Is 9mm ammunition with head stamp fc military or civilian? Which 22 long rifle ammo has a triangle stamped on case? What do head stamps on casings mean? What caliber shell has a headstamp HXP71? What Caliber is a Rifle Cartridge Case Marked WMA 15? What does the "t" headstamp signify on a 22 caliber rimfire casing? What manufacturer stamps CBC 13 on their bullets? How to date peters 38 bullet casing? What do the markings on bullets meam? What cal. rifle has bullet case marked 22 72 on base? What does lc31 stamp on a shell casing mean? How to identify bullet manufacturer? What does the number indicate on the headstamp of tzz ammo? What can a head stamp tell a forensic firearms examiner? How to realise ammunition marks? What does pistol brass head stamp WIN mean? How to read ammo head stamps? How to read a 50 cal headstamp? What caliber is a bullet marked with a 13 and the letters WMA? How to identify old military rounds and blanks? How to age winchester brass from headstamp? How to identify rifle ammunition? How to read brass head casings? What is e stamp on ww2 handgun? What does headstamp cartrige mean cartridge casing markings? What do headstamp marking signify? How to read bullet cartridge headstamp? What bullet manufacturer has fc as a stamp? What ammo manufacturer has a diamond on the case? What 22 ammo has a "C" as headstamp? What kind of rifle round has PCH 38 stamp on the back of it? What ammo company has triangle on base? What ammo company had a C at base of round? What manufacture 38 cal casing marking R574? How to idenitfy a 45 auto cartrige? How to idenify writing on rifle brass case base? What is head stamping in regards to bullets? What ammo has head stamp markings Lc82? Where can I find what the markings on a bullet casing mean? What does the letter R mean on a ammo shell casing on a 600 gr. shell? How to identify unusual ammo? How different countries stamp ammunition? What do the letters CDC stamped in the bottom of the cartridge mean? Which bullet has a triangle stamped on the bottom of 9mm? Are winchesters rifle brass the same if they have different head stamps? How to identify 22 mag amunition manufacturer? How to identify military 7.62 ammo? How to identify egyptian 9mm ammo? What do numders on bottom brass shell mean? How to read lc brass headstamp? How to identify manufacture of 223 ammo? How to identify bullit casings? What do the letters mean on 22 cal. ammo? What cartridge has an h on the base? What year did they start headstamping? 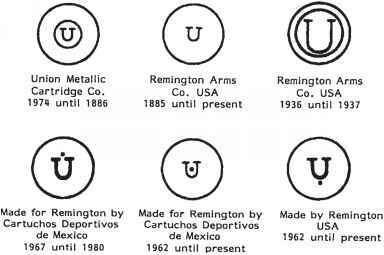 What year did remington use the headstamp rem umc? What are the stamped writing mean on a windshield? What does number mean on 40 caliber federal shell casing? When did winchester drop "winchesterwestern" on ammunition head stamps? What does a 22 and 78 staped on the rim of a 7.6254r bullit mean? How can you tell what cartridge maker brass is? What do the munbers mean on rifle ammo? How to mark on a bullet or shell? What does the letters/numbers mean on the bottem of rifle cartridges? What country marks ammo sprg? HOW TO READ THE HEAD STAMP ON AMMUNITION? What do the stencil marks on the base of 5.56mm ammunition mean? What kind of ammo is marked fc 60 match? Who manufactures a bullet stamped G S? What do the numbers on the primer end of military ammo mean? Who makes bullet with cases mark188 78? Does ammo need caliber designation on headstamp? When were head stamps started on bullets? Is WMA a military on head stamped casings? What does the writing on handgun brass mean? What are the markings on 5.56 casings? What does WRA stand for on the headstamp of bullet cartridges? What does 3240 mean on a bullet headstamp? What are the markings on Remington brass? What does p s* 60 38 mean on 8mm cartridge info.? How to read the markings on nazi ammo boxes? What does the letter H stamped on the base of Winchester’s rimfire ammunition stand for? What do the markings on the rear of a .303 bullet mean? Does 223 cartridge casing has ejection mark? What do the numbers mean on a lake city cartridge? Who makes 22 ammo with a w on the primer ? How to identify ammo cartridges? What do the letters stand for stamped in the bottom of ammunition? What kind of case head stamp does Berger Bullets use? What kind of bullet has 70277 on it? What 22 magnum brass is marked T? Does remington arms manufacture an 8mm caliber rifle? How police use bullet head stamps? What is the letter f on the bottom of .22lr? What is the origin for the cartridge Head stamp requirement? What info is written on the head stamp of ammunition? How to read gun cartridges in forensics? How to read ammo headstamps? How to read a casing headstamp? What is casing stamp on ammuniton? Who makes a 3006 marked c124? What is F stamped on 22 caliber ammo? What caliber is marked cbc18 onthe headstamp? What year did manufacteurers start using headstamps on ammunition? What do the number mean on a cartridge headstamp? What is a bullet shell casing head stamp?